We want to make everyday life easier for consultants, installers and contractors. Our program IV Produkt Designer will help design and dimension the air handling unit. For several years IV Produkt has been producing software that is intended as an aid in designing and dimensioning an air handling unit. IV Produkt Designer is a product selection program designed for IV Produkt’s air handling units. IV Produkt Designer is simple and intuitive. 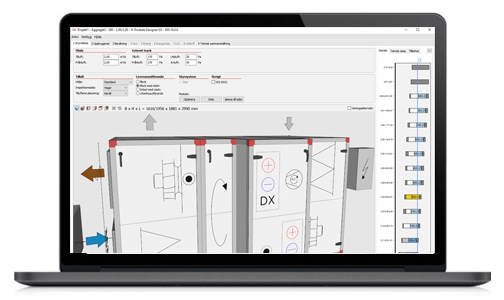 The program generates dimensioned unit sketches that can be seen in 3D from different views. IV Produkt Designer also includes a standalone LCC calculation project. This gives you the ability to calculate the energy cost of your existing air handling unit. A handy aid when you need to implement an energy declaration. You can find the LCC program at the bottom of the menu in IV Produkt Designer. Build your unit in IV Produkt Design G3 to obtain a dimensioned and finished drawing with technical data containing SFPv values, temperature efficiency, sound data and much more. The program generates a three-dimensional model of the air handling unit, which can be exported to AutoCAD (DXF). Captions, AMA, are available for each project run in the application, and can be exported to a Word document. The caption is a documentation of the unit and forms the basis for instructions, operation and maintenance, and can be used to copy information to project documents.